When choosing the right kind of flooring for your home there’s a lot to get your head around. There are so many options it can get more than a little confusing. When faced with such a choice the traditional way of making a decision is to make a pros and cons list; in other words, list all the pros and cons of each choice and add it all up. 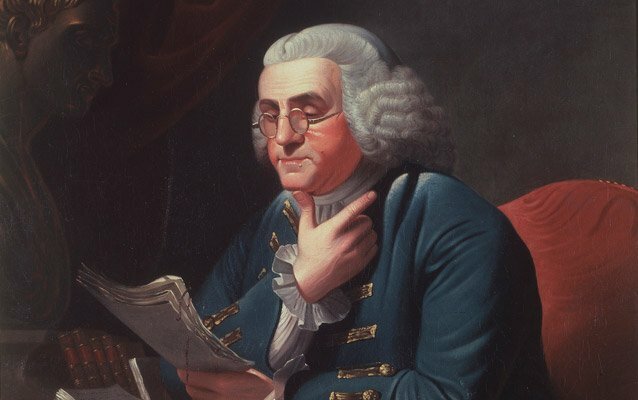 Even Benjamin Franklin recommended the method. However, according to a recent issue of the Harvard Business Review, that’s not always such a great way of making the optimum decision; check out this article for reasons why, but it’s mainly down to what they call “cognitive bias.” A much better way is to quantify your lists by scoring each feature on a scale of 1 to 10, 10 being the most positive, and choosing the option with the highest score. Well, that is exactly what we have done for you here. 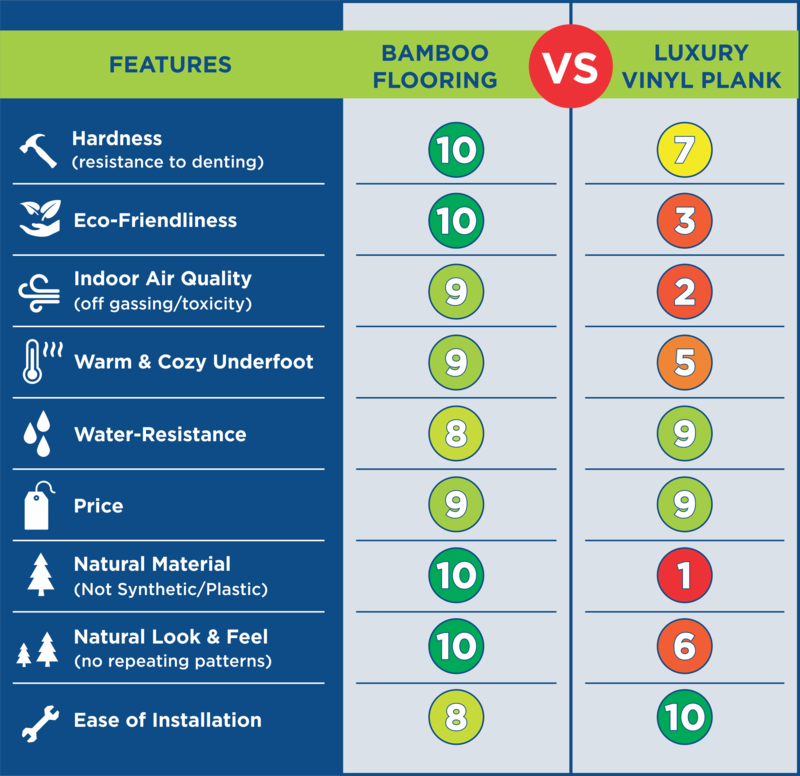 Many of our customers ask us about the differences between bamboo flooring and luxury vinyl plank (LVP), so we have listed all the most important features you should consider when choosing your floor and we have assigned an objective score to each of them. Here is the table we came up with. We think the conclusion is fairly obvious, but we will leave you to do the math. After all, we wouldn’t want to be accused of cognitive bias. Following the table, we will go through each feature in some detail. Bamboo – especially the – is extremely hard – in fact it’s one of the hardest floors available in the market, hands down. Engineers measure the hardness and density of wood and other materials using the , which measures the force needed to drive a small steel ball into the material. On this test, strand woven bamboo consistently achieves ratings over 4,000, making it around 2-3 times harder than most traditional hardwoods. Hardness is important for several reasons. The harder the flooring, the less susceptible it is to being dented by heavy furniture and heels. Another huge benefit to bamboo is that it rarely if ever needs to be refinished in a residential setting, greatly lowering it’s long term maintenance cost and increasing the resale value of the home. 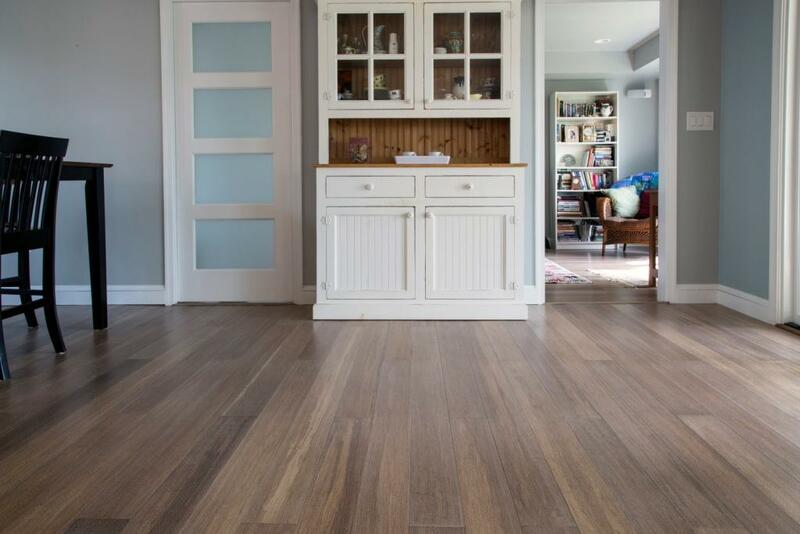 Bamboo’s hardness rating of over 4,000 means that it is one of the most durable floors you can install, which is why we give it a score of 10 out of 10. Luxury plank flooring is also a durable choice. Made from multiple thin vinyl layers and finished with a scratch resistant coating, LVP is long lasting even in heavy traffic areas. However, it isn’t as hard as bamboo and so is more likely to be damaged by heels and heavy furniture. Vinyl floors can be punctured with heavy, sharp objects, and the only repair is to replace the entire plank. We rate its hardness as 7 out of 10. Bamboo flooring is the most eco-friendly flooring you can find, with the possible exception of . Bamboo is really a grass, even though bamboo flooring looks like hardwood. It grows rapidly, sometimes several feet a day, and it matures in just five years. When we harvest bamboo, we do so without affecting the eco-system in any way. We leave the roots in place, so they can immediately start to produce a new bamboo plant; we don’t disturb the soil or damage the wildlife, and we don’t even need any pesticides or fertilizers; which is why we score its eco-friendliness 10 out of 10. The reason vinyl flooring is called vinyl is that it is made from polyvinyl chloride or PVC. In the US we manufacture 14 billion pounds of vinyl flooring a year, which frankly is an environmental hazard. During its manufacture, carcinogenic dioxins are produced which accumulate in the environment and pose a huge risk to the health of anyone who comes into contact with them. Other toxins produced include phthalates and ethylene dichloride which both pose serious health risks. We think we are being a little generous awarding LVP an eco-friendliness score of 3 out of 10. Volatile organic compounds (VOCs) are gasses emitted by certain substances and which can be damaging to health creating both short-term and chronic long-term problems. They are particularly harmful in homes where their concentration is up to ten times higher than outdoors. The advice is to minimize the level of VOCs in your home by making better choices of the materials you introduce and increasing ventilation levels. You will be happy to know that bamboo flooring produces very little VOCs. Although trace amounts of UF adhesive is used in the manufacture of engineered bamboo flooring, this produces only a tiny amount of VOC compared with other flooring materials; so low that we give bamboo an air quality rating of 9 out of 10. The only floors that are more safe than bamboo for you and your family (and it isn’t by much) are traditional hardwoods and linoleum. Quantities of those materials created during the manufacture of LPV such as dioxins, phthalates, and ethylene chloride along with many others remain in the material after manufacture and will be released slowly in your home. This seriously affects the air quality in your home and poses an ongoing risk to your health and that of your family. Which is why we have awarded LVP an air quality rating of just 2 out of 10. There’s nothing like having a warm floor on a cold winter day, especially when you wake up barefoot for your morning cup of joe. Bamboo flooring is an excellent thermal insulator which is why it always feels warm to the touch. Without getting too technical about this, the thermal resistance of a material is how resistant it is to heat flow; the higher the thermal resistance the more warm and cozy the material will feel underfoot. Thermal resistance is measured in terms of BTUs per hour using a complex unit h·ft2·°F/Btu, but we’ll just call it R. The R-value for bamboo flooring is 0.72, while that of vinyl flooring is 0.2, making bamboo three times as cozy; which is why we award it a warm and cozy underfoot rating of 9 out of 10. As we have said, the R-value for vinyl is 0.2, which is way below bamboo. To compare it with other flooring materials: carpet ranges from 0.7, about the same as bamboo, up to 1.6; and linoleum has an R-value of 0.26. LVP flooring is a little better than plain vinyl, so we award it a warm and cozy underfoot rating of 5 out of 10. Bamboo flooring has greater water resistance than hardwood flooring, but that doesn’t mean it is entirely waterproof. If you spill water or any other liquid on the floor and wipe it up reasonably quickly with an absorbent cloth, there should be no staining or damage, but if you leave a pool of water on the floor for more than 20 hours then you might expect to see some staining and swelling. While you can install bamboo flooring in areas with high humidity levels, it isn’t advisable to install it in areas such as bathrooms where it may be in frequent contact with water. Overall, we award it a water-resistance score of 8 out of 10. LVP is more water resistant than bamboo, and some LVP flooring is sold as waterproof. In fact, if you spill water on LVP floors, you can leave it to evaporate, and there won’t be any damage. There is an important caveat, however. If you install it on concrete, then moisture can react with the concrete to create a highly alkaline solution which is likely to degrade the LVP, which is why award it a water-resistance rating of 9 out of 10. Both bamboo and LVP flooring have similar price points, and both are widely available online and in local stores. You can get high quality bamboo and LVP shipped to your home for between $4 to $7 per square foot. This is significantly less than hardwood which can be several times more expensive. While they’re both budget-friendly, you are not trading cost for quality if you choose the right brand. Bamboo is in every way as good if not better than hardwood, and LVP can also be an excellent choice. They both deserve a price rating of 9 out of 10. Bamboo is a with many eco-friendly qualifications. It is sustainable, doesn’t damage the environment, and soaks up copious quantities of carbon dioxide during its rapid growth cycle. You can’t get more renewable or natural, hence our score of 10 out of 10. As it says on the tin, luxury vinyl planks are vinyl; a man-made plastic derived from crude oil. It also includes many additives such as phthalates. It is non-biodegradable, so will remain in the environment forever, not to mention the toxins created during manufacturing. Score: 1 out of 10. One of the more attractive features of bamboo flooring is its and highly unique marbled grain pattern. No two planks will ever be identical and will differ subtly in their color, tone, and grain pattern. This natural variation can be used to great effect when installing a bamboo floor. A good tip is to work from all your boxes of planks simultaneously; this way you will obtain a uniformly varying natural variation finish across your entire floor. We award bamboo a natural variation rating of 10 out of 10. Although printed and “wood-look” veneers have come a long way, there’s no denying that even the untrained eye feels “something isn’t real” about synthetic floor surfaces. As LVP is entirely man-made, there is no natural variation. It can still look great and can be made to have the appearance of wood with high definition printing and the like, but in the end there will be repeated patterns and planks that look similar, in addition to just looking, well, a bit fake. That almost covers the main differences between bamboo and LVP floors. There is, however, an additional feature of both of them which is their ease of installation. Both can be easily installed by a reasonably skilled DIY enthusiast, but LVP is often a little easier as it can be laid over surfaces that are not perfectly flat, unlike hardwoods/bamboo/tile which require level sub-floors. You do need to be careful though that you don’t install LVP floors directly over concrete. As we have already mentioned, any damp can react with the concrete to produce an alkali which can degrade the vinyl. Altogether for ease of installation we will score bamboo 8 out or 10 and award LVP full marks – 10 out of 10. We said we would leave the math to you, but we can’t help ourselves, so here you go!